A seizure of arms from the Islamic-state aligned Maute Group (AKA Islamic State of Lanao) in the Filipino city of Marawi, earlier this year, included an Indonesian Pindad SS1-V1 5.56 x 45 mm self-loading rifle. Captured alongside a range of commercial and military AR type self-loading rifles, the Pindad rifle stands out as it is uncommon outside of Indonesian service, and has seen only limited use in other countries. The first images of the capture were posted on the public Facebook page of a Filipino Army Public Affairs Officer on 8 June 2017. The rifle appears to be in working condition, and is fitted with a hastily-modified two-point sling. Although none of the weapons pictured are fitted with magazines, the SS1-V1 uses STANAG magazines so a supply of available magazines would not be an issue for the Maute Group, which makes extensive use of AR-15 pattern small arms. 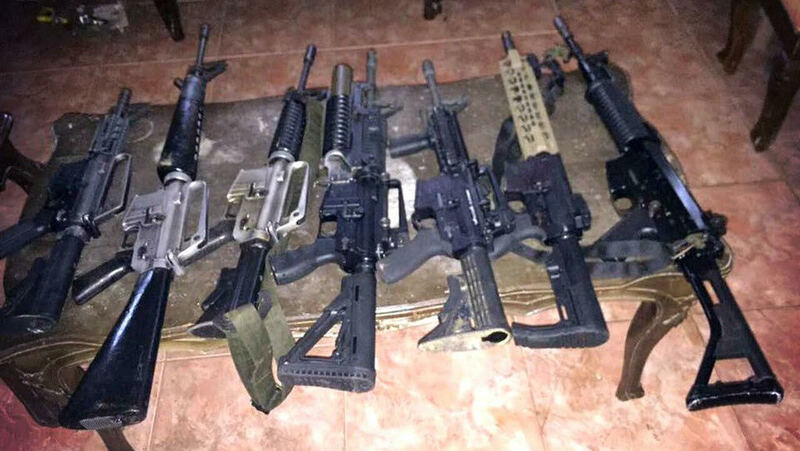 Primary sources for these guns are local black markets, weapons captured from Filipino military and law enforcement, and limited numbers of craft-produced copies. This isn’t the first appearance of the SS1-V1 rifle in the Philippines. In 2009, some 100 Pindad rifles were seized on the island of Bataan, making public headlines, amid controversy regarding the Indonesian company Pindad’s export sales, the ship’s captain claiming his cargo was legal, and even claims that local politicians might be ordering the rifles ahead of local elections to try and influence the outcomes through violence. The rifle in use by Maute Group fighters was most likely purchased on the black market, however this can not be stated definitively. A quick assessment of open source intelligence has not indicated other examples of SS1-V1 in propaganda released by the group. One possibility is that the rifle may have come to the Philippines via the conflict in East Timor. The SS1-V1 is a close, although not exact, copy of the FN Herstal FNC, produced under license by the Indonesian state-owned PT Pindad armory. It entered service with Indonesian military and law enforcement entities in 1991, but was subsequently supplemented and eventually replaced by the SS2 model in the early 2000s; the latter is essentially an FNC design with more substantial modifications. Operating as a select fire, magazine-fed, gas-operated rifle, the SS1-V1 is currently still in service with Indonesian security forces in a reserve capacity, and has been exported to several other states outside the Southeast Asia region. It remains available from the manufacturer today. Technical specifications and SS1-V1 rifle image taken from the PT Pindad website. 1. Leftover from Poso Conflict (Sulawesi / Celebes). During the conflict some militants purchase/raid military/police arsenal. This is the most likely explanation because ties between Islamist in Sulawesi and Philippines are really close. In fact some of ISIS member in Marawi comes from Indonesia and until now Sulawesi were often used as training place for some Jihadist terrorist group. 2. Leftover from Aceh conflicts. Aceh separatists use a lot of captured Indonesian army equipment and even after the peace treaty leftover weapons from the conflicts is still a major problem there. But it’s unlikely due to distance between Sumatra island and Philippine. Moreover Aceh Separatist even though following strict Islamic law. Never really make ties with Jihadist organization such as Al-Qaeda backed Jamaah Islamiyah.